There has been a noticable buzz of activity at Valley Lutheran High School this school year, though it hasn’t been restricted to the classroom. 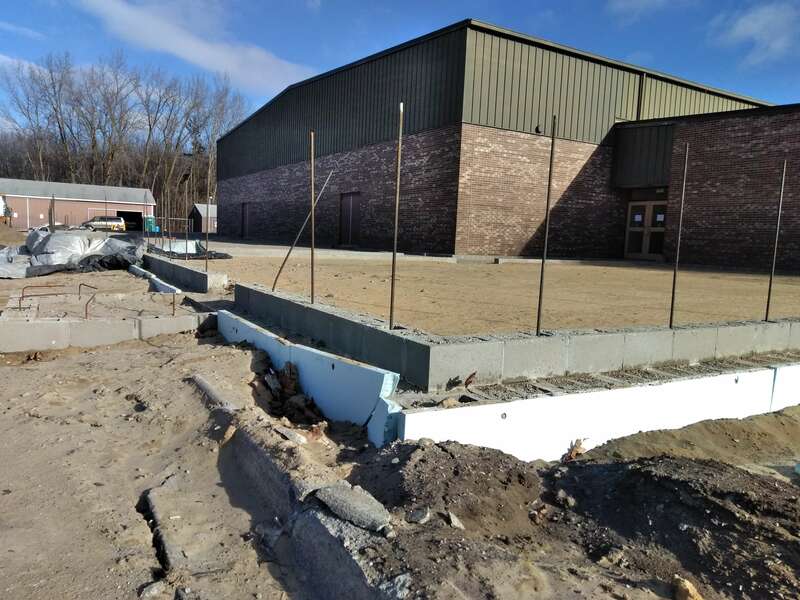 Since breaking ground on the 30,000 square foot addition last fall, Valley has begun the building process in earnest with changes made to both the east and west sides of the building. A grove of trees was removed on east side of the high school in preparation of actual construction over winter and early spring on what will be the new science labs, music room, art room, special needs room, and common spaces. Therefore primary activity has been focused on the west side of the building in what will be new athletic facilities, locker rooms, and offices. The area was cleared during the fall. Footings have been poured and foundation blocks laid in anticipation of the steel framed walls being constructed. The athletic facilities are projected to be completed in time for the fall season next school year. Once the walls to the athletic facilities are up and construction begins in earnest on the east end of campus, activity will increase with crews of construction workers, electricians, equipment, machinery, and more. Already, the staff parking and athletic parking lots have made way for the mechanisms of building and progress. While there has been progress in the area of building construction, fundraising for the campaign also continues. As of the end of December 2018, the campaign has raised $7.8 million out of the $10 million goal. He also thanked Valley’s current parents and grandparents who’s giving at the end of 2018 unlocked a $25,000 match opportunity from a longtime Valley donor. “We’re excited to continue working with our current parents, grandparents, alumni and association churches towards achieving our ultimate goal,” DeWees said. Click here to see the full February 2019 Valley Vision.